This entry was posted on September 28, 2018 by piranha. We’ve had the most amazing summer and we don’t want to be the bearers of bad news but, autumn is not too far away. The cooler mornings are setting in, the sun disappears more quickly in the evenings, and the leaves are starting to change colour. However, this is no excuse for letting your customers feel the post summer doldrums yet. Help them extend the experience of the summer feel-good factor for just a little longer by bringing them a barbecue! Don’t let the chillier weather stop you from bringing out the grill at this time of year. There’s a whole bunch of reasons to keep the barbecue uncovered, bringing families and friends together for an alternative to the traditional Sunday roast, or for weddings, parties and other events. A wide range of fixed and portable patio heaters mean that you can continue to create a toasty, relaxing atmosphere in an outdoor setting well into the colder months. Keep your guests cosy with a warming fire and by supplying a few well-placed snuggle blankets. Two days before your event, mix the rub together and put into a large ziplock bag. Add the beef ribs and massage the barbecue rub into the flesh. Up to 2 days in advance make the glaze. Heat the oil in a large pan and sauté the onions and chilli for about 10 minutes until softened. Add the maple syrup, sugar and cider and bring to a simmer, stirring to combine. Remove from the heat and whisk in the mustard, Worcestershire sauce and tomato puree. Blitz with a hand blender until smooth. Set aside to cool completely. Once the ribs have been marinated, preheat the oven to 130°C/275°F/Gas Mark 1. Wash off the rub under cold running water and place in a large heatproof casserole with a lid. Pour over the glaze, cover tightly and roast for about 5 hours or until the beef is very tender. Leave to cool at room temperature and then place in the fridge to chill overnight. On the day of the barbecue, remove the ribs from the fridge and take off any solidified fat off the ribs. Allow to come back to room temperature and transfer the ribs into a dish ready for the barbecue. Reduce the rest of the glaze down until it will nicely coat the ribs. If using a charcoal barbecue, light it 30 minutes before you want to start cooking. 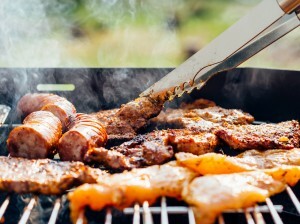 If using a gas barbecue, light it 10 minutes beforehand. Place the ribs on the barbecue on medium hot coals and cook for 10-15 minutes on each side or until the meat is completely warmed through and the edges are sizzling, basting every 5 minutes or so with the reduced down glaze. Garnish with the thyme sprigs and serve. And, while there’s nothing quite like the aroma of barbecued meat on a cooler evening, adding the many beautiful colours of the wide range of autumn vegetables will help to create the perfect atmosphere. In fact, September onwards may be the perfect time to entice your diners in with a grill!